Amid the gold, silver, and black tones at Chanel's 2018 Resort Show, the models who walked the runway were transformed into Grecian goddesses by renowned hairstylist Sam McKnight. From disheveled blowouts to half-ponies to messy buns, all looks were secured into place using various clips and headbands. And tbh, though the clothes and the set design were both breathtaking, it was the customized headbands that caught our eye as they ~seamlessly~ adorned the models' tresses. The hair accessories looked like gold crowns that Blair Waldorf would be proud to wear! To create the perfect summer accessory, McKnight first used thick-cut black ribbons as the base, then he slipped textured and embellished headbands over the top for an effortless layering effect that, according to Vogue, "conjured a dressed-up cool girl in party mode—particularly when it was finished with an edging of thick black liner." 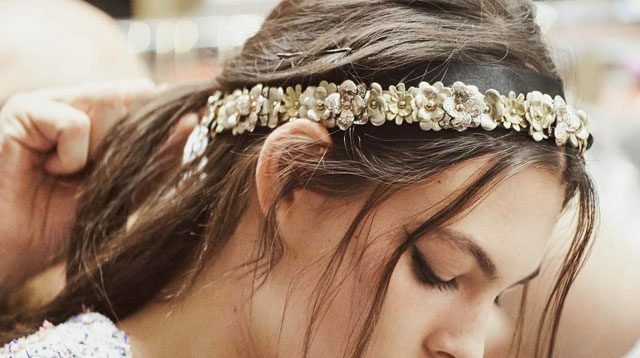 Are you ready to give headbands another shot?